In 1937 the University Women’s Club of Victoria (now CFUW Victoria) invited Emily Carr to become an Honorary Member of the club. 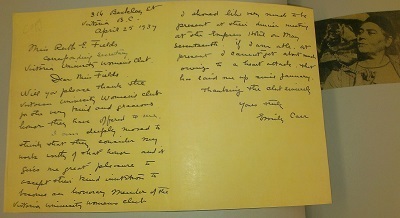 Copies of two letters written by Emily Carr have been turned over to Carr House. UWC Victoria hosted a 70th birthday celebration for Emily at the home of Rosalind Young, the first president of the club. Lawren Harris, noted Canadian artist of the Group of Seven, often visited Emily on his trips to Victoria, and members of the club were delighted when they were able to attend his lectures. "Will you please thank the Victoria University Women's Club for the very kind and gracious honor they have offered to me"
In 1990 the Recent Grads Interest Group established the Recent Grads Bursary at the University of Victoria. For a time they held annual celebrations of the birthday of Emily Carr as a fundraiser for this bursary. Ian Ross, curator of Carr House, is always delighted to have a group of CFUW members visit the Carr Museum. Some CFUW fundraisers have been held there in recent years (from CFUW Victoria Archives). “I had always maintained that unearned honours were stupid shams. Look how hard real members worked to earn their membership—why should I, never having even squeaked through High School, be honoured by a University Club membership? Half of me said, “I can’t!” The other half said, “But, I would be very proud.” So I took, thanked and am.” (1946, Emily Carr, Growing Pains, p. 368). 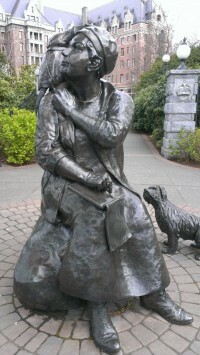 Victoria-born Emily Carr is British Columbia’s most famous artist. Her art and writings are recognized across Canada. Emily grew up with a passion for art and a love of nature, especially animals. After high school she studied art in San Francisco. Later she travelled to England and France to refine her style. A trip to the native village of Ucluluelet in 1899 opened the world of Aboriginal culture that inspired her to paint images of the vanishing totem poles in their natural setting. An art exhibit in Eastern Canada in 1927 brought her to the attention of a wider public. Carr’s later paintings drew inspiration from the deep forest itself, painted in vivid strokes of colour. After 1939, when ill health curtailed her painting, she turned to writing, winning the Governor General’s award in 1941 for Klee Wyck. She went on to publish more books and win new recognition as a writer. 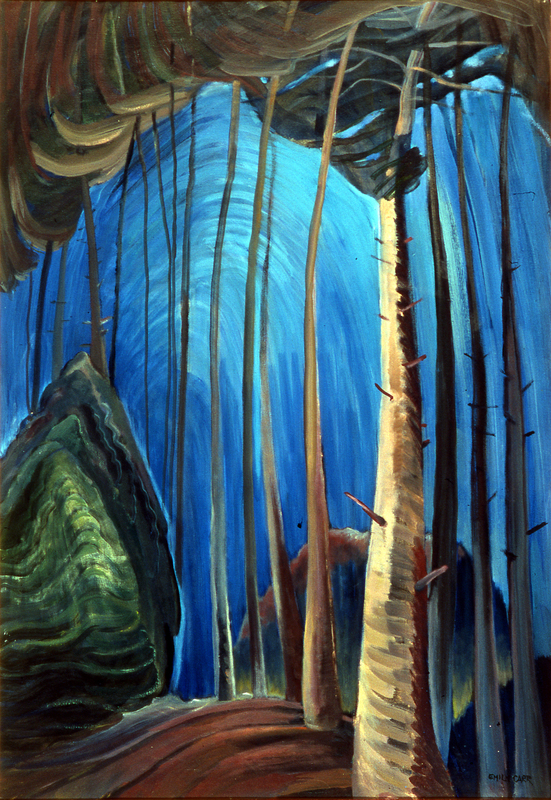 Emily Carr celebrated the British Columbia landscape in an original and vigorous way, from the “turmoil of growth” to the “space and glory of the sky”. A person of deep spirituality, she reflected upon nature and humanity. She is a kindred spirit for all times. 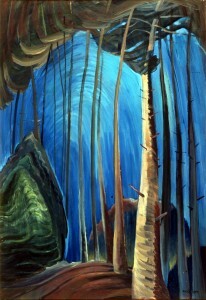 The Art Gallery of Greater Victoria has graciously allowed us to share this beautiful Emily Carr painting with you. Click the picture for a larger version. Excellent Art Tours can be arranged through the gallery with docent Corrine Taylor to take you into the wonderful world of Emily Carr's works.